It’s ultimately more productive to use a computer if you never have to take your hands off your keyboard. Obviously some things can only be done with a mouse, but the more you can do with your keyboard, the less time you’ll have to move your hand off the keyboard, to the mouse, and back again. We’ve featured some keyboard shortcuts for Microsoft Word, keyboard shortcuts for Outlook and even a handy keyboard shortcut for Chrome but now we’re going to introduce you to a bunch of handy “Run” commands that get you going quickly without your mouse being involved. winword: This opens up Microsoft Word. outlook: You guessed it: This opens up Outlook. Similarly, you can use “outlook /safe” to open up Outlook in Safe Mode, which disables all Add-Ons and some features, which can help in troubleshooting. chrome: This opens up chrome if you have it installed. iexplore: Opens up Internet Explorer. firefox: Sensing a pattern here? This opens up Firefox, if installed. This works with some programs, but not others, depending on what their executable filename is (that’s why it’s “winword” above instead of “word”, which is a holdover from when the program was first created). calc: Opens up the Windows calculator. notepad: Opens up Notepad to scribble down a quick text note. sndvol: Sound and volume adjustments. resmon: If you’re curious what is bogging down your system, this advanced tool can help track down the culprit. charmap: Character map, that handy little tool to copy symbols out of your typefaces. cleanmgr: Runs the Windows Disk cleanup tool. To clean things up further, we have more Windows clean-up tips here. winver: Need to know precisely what version of Windows you’re running? This will tell you. snippingtool: Open the Windows snipping tool (we prefer other screenshot options). fonts: Opens up the fonts folder so you can install or remove fonts from your system. %userprofile%: To open up the current user profile folder. \ : Typing a simple \ in the run dialog will open up your C: drive. .. : Two dots “..” will open up your computer’s user folders. You shouldn’t have to mess with anything in here (or on the C: drive for that matter) but occasionally it’s needed. 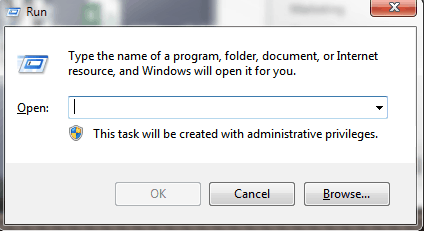 services.msc: This opens up the Windows services dialog, which allows you to start and stop Windows services. appwiz.cpl: Open up the add/remove program area in Windows to quickly add, remove, or tweak programs. cmd: Open a command prompt. devmgmt: Open up Device Manager. eventvwr: View Windows event logs. Have a run command you use a ton? Share it in the comments below!